Kupo-con is a fan run event that brings together fans of Final Fantasy to celebrate the franchise as a community. After hearing about this event from a mutual friend on twitter I decided to book a ticket and go along when they announced the event of my home city of Glasgow; which they have charmingly dubbed “the wee pom” As a fan of Final Fantasy for over 20 years, this event seemed right up my alley. A fan event for fans of the games run by fans themselves, taking place at a Hilton right in the city centre of Glasgow. So I eagerly went along hoping for a fun event. It did not disappoint. From the get-go you can tell that this event is very fan orientated and focused. The venue itself being right in the heart of the city centre, a few minutes walk away from Sauchiehall Street, which is one of the main streets in the highstreet where several shops, restaurants and night clubs are situated. The hotel is also a ten minute walk away from central station, making it a prime location which is easy to access. When I arrived the registration process was very smooth. The hotel lobby receptionist was very polite in telling me the event was on the entire third floor of the hotel which was luckily only one floor up from the main reception. Upon arriving it was very quick to get registered, receive my pass and complimentary gifts for buying a pass a certain level. At this time it was just after 9am with the event officially opening at 10am. During this time vendors where still getting sorted, some were open and trading and everyone was just chatting until things kicked off. 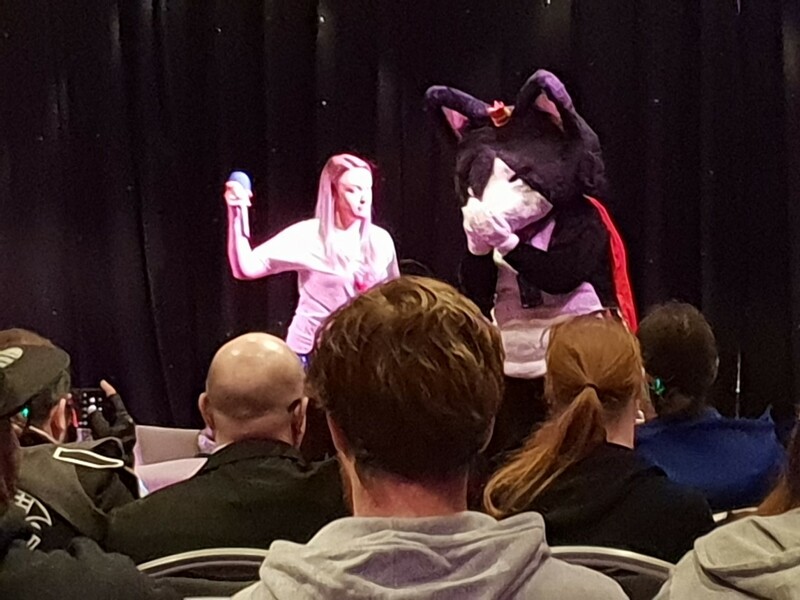 The event kicked off with an opening ceremony at 10am which acted both as a greeting session, explanation of the convention rules and finished with a masquerade ball for cosplayers who wanted to show off their costume and get pictures taken. My general experience with masquerade balls are the ones that mcm do. That tend to be at the end of the day. I liked the fact that this took place at beginning. Everyone still has their costumes in tact, still alert and awake and works to introduce themselves since it is a lot smaller group of people and more intimate event than you'd find at an mcm. During the ceremony the convention was explained with an itinerary of events planned and each attendee was given a book. In the book it explains the general rules. The usual respect everyone and don't be a creep to cosplayers(As one should act) but also the real meat of what the con is, was contained within. Within the book there were various quests and hunts much like you'd get in a Final Fantasy game. By taking part in various events, taking various pictures with cosplayers and interacting with other people; con goers would gain either experience or gil. Gil is the currency of Final Fantasy and within the con there is a dealers table that you could buy items with gil(You can still buy these items with cash if you prefer) By getting enough experience you could trade it in for gil. The quests involved things like talk to someone you've never met and take a picture together. Take a picture of you with a cosplayer cosplaying as a certain character and so on. I loved this aspect of the convention. Talking to people you don't know, asking them for a photograph can be awkward but with the context of “I'm doing this for points” really relieves the tension of doing it. It acts as a great icebreaker to get people to talk to each other, compliment their cosplay and even get conversations going. As well as that the aspect of having a fun day meeting new people and getting tangible rewards for it is a rather neat and fun concept. Also from this there were planned events with fan interactions. These took the form of FATEs as most people will recognise from Final Fantasy XIV were audience participation is key. There were fun games that make very clever references to the game. Such as marching along to the Junon harbour march and doing a simon says type game like the march Cloud does during that part in FFVII. Also another highlight was when everyone played Kazoos along with certain memorable tracks from the games. Such as Cosmo Canyon, Gold Saucer and best of One Winged Angel. 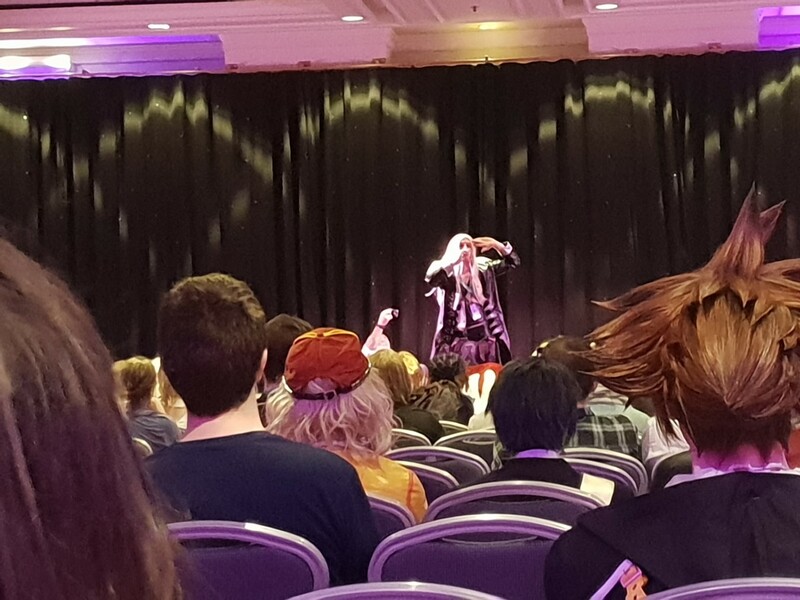 Which was even more special when a Sephiroth Cosplayer was invited on stage to act as an impromptu conducter for the audience. Even better was when said cosplayer was rewarded for this with some gil in a hilariously raunchy fashion. 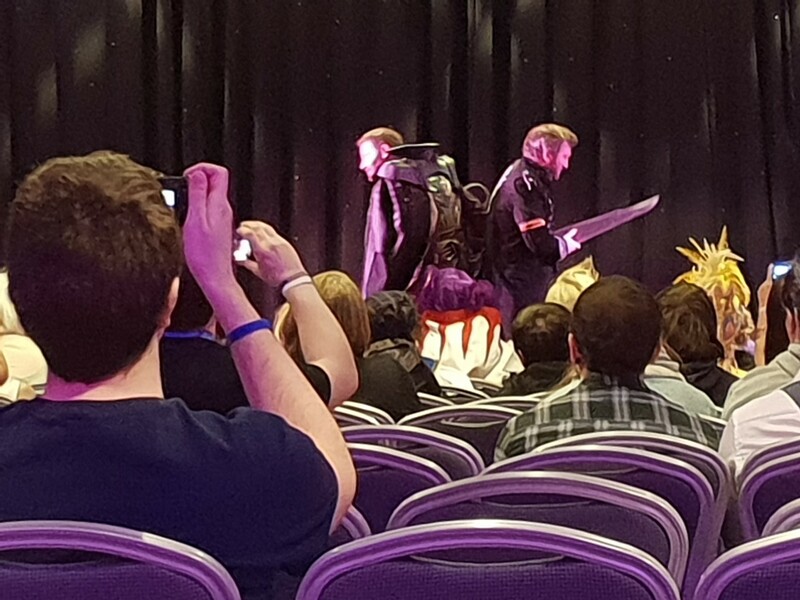 Other than this there were signing sessions by voice actors from Kingsglaive, Robbie Daymond(the voice of Prompto from Final Fantasy XV) and Quinton Flynn (Axel from Kingdom Hearts, Reno from Final Fantasy VII and Raiden from Metal Gear Solid) all of which had a panel where they were interviewed. All of which were very good interviews that were all informative and entertaining in various way. The Kingsglaive group gave some great insights into the motion capture process, Robbie had some hilarious anecdotes and Quinton gave some rather interesting points on what its like to voice a character like Axel who goes through rather sudden changes between the various Kingdom Hearts instalments. All of which were great interviews and very insightful. Showing the knowledge of the interviewer. 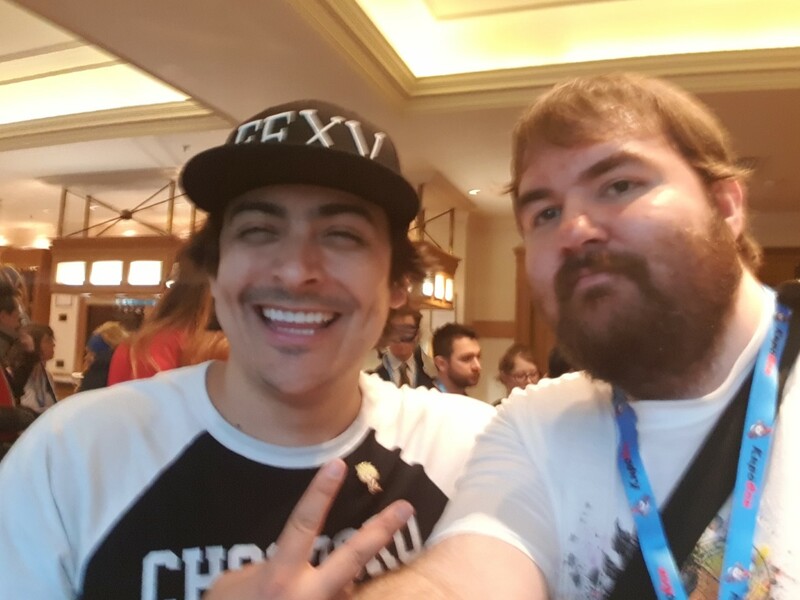 The main point that I really took away from my time at Kupo-con is that this genuinely was a fan event. One not just to celebrate Final Fantasy but the celebrate the fandom. The whole event felt so wholesome and welcoming. So much so, that this started off my day as someone I sat next to noticed it was my first kupo-con and told me to enjoy my first Kupo-con. That mentality and attitude really did carry across the entire event with everyone. It was very inclusive, friendly and welcoming. What I want for an event like this. A fun event that really makes the fandom feel like a large gathering of friends and family. If Kupo-con ever decides to return to Glasgow I'll surely be back, if not I would definitely consider going to one at another UK venue.